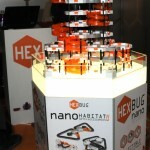 HEXBUG nano Space adds an intergallactic factor to the popular miniature robotics product line. Black Friday is here, officially marking holiday shopping season 2013. 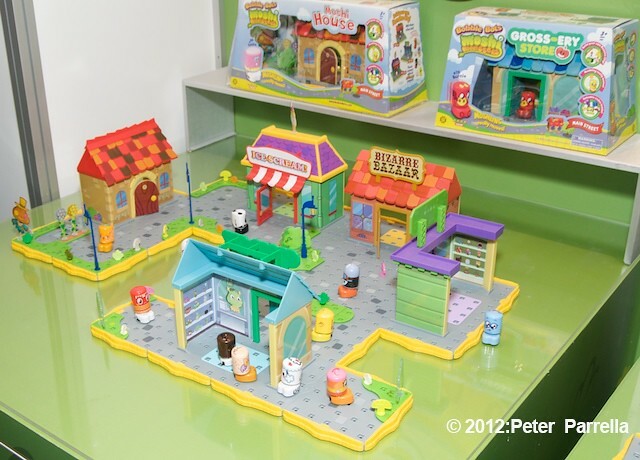 I’ll be posting info about some of my favorite goodies during the next couple of weeks. I hope I can turn you on to some fun gifts, or something for your own wish-list. 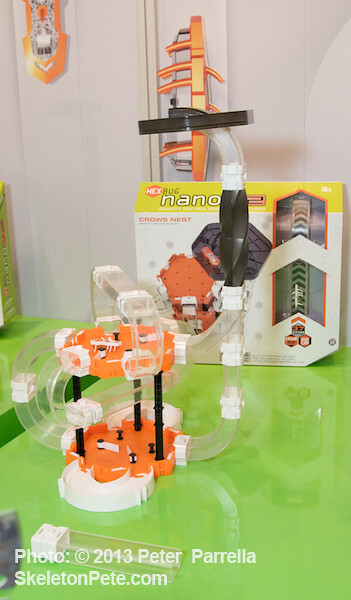 Innovation First continues to refresh their popular Hexbugs Nano series with new skills and environments. 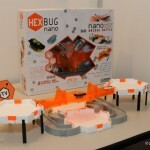 Hexbug Nano V2 follows last year’s Hexbug Nano Warriors, which offered multi-bug battle action. 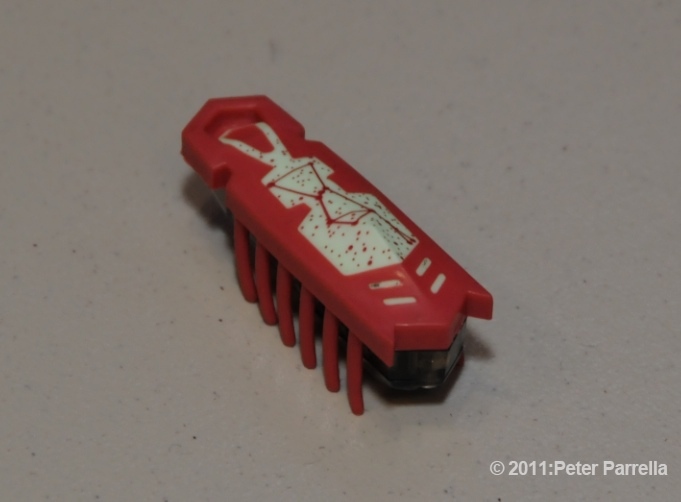 This newest species of skittering scarabs has evolved to include three rubbery spikes on their spines which allow them to shimmy vertically up and down habitat tubes. 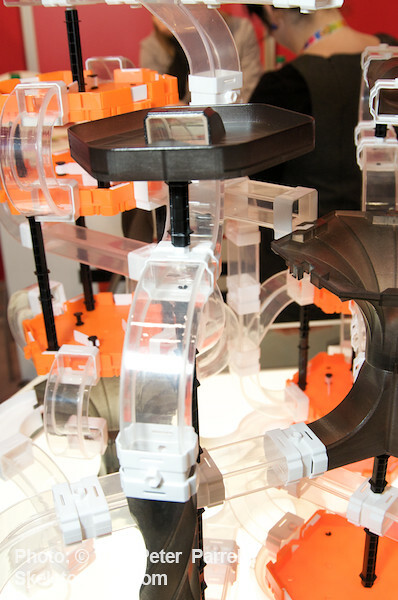 As with prior generations, the modular nature of individual track and tubes pieces ensures that sets can be configured with imagination nearly your only limitation. 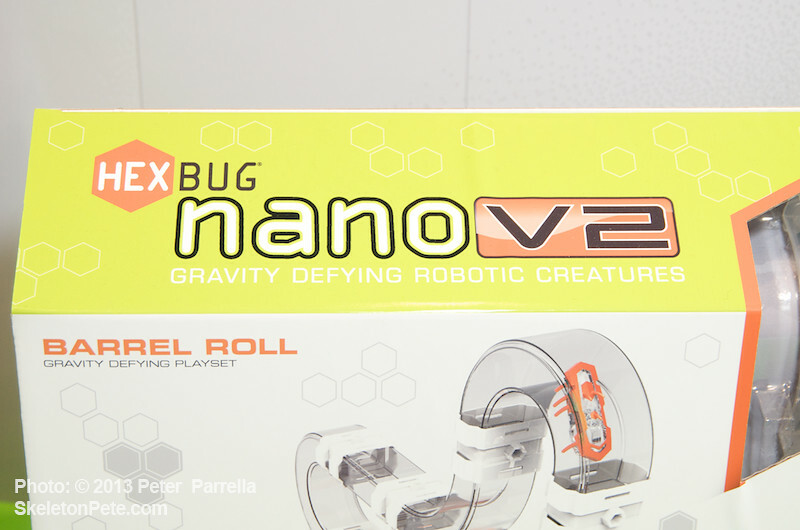 Specialty constructs have been added to the line to maximize the fun of the Nano V2’s abilities. 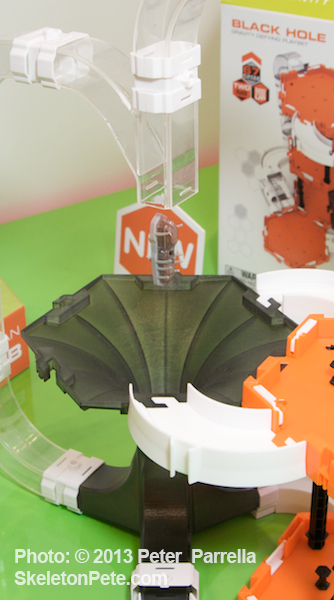 The Twist Tube adds a 360 degree spiral to the hexbugs’ bag of tricks, the V2 Black Hole Funnel offers a destination for Nano freefall with a variable exit routine at the bottom, and the flat panel Observatory creates an ultimate height destination for the V2 models to explore before they descend again. Tube width allows adventuring buglettes to pass each other en route or share a trip with frenetic fraternity. 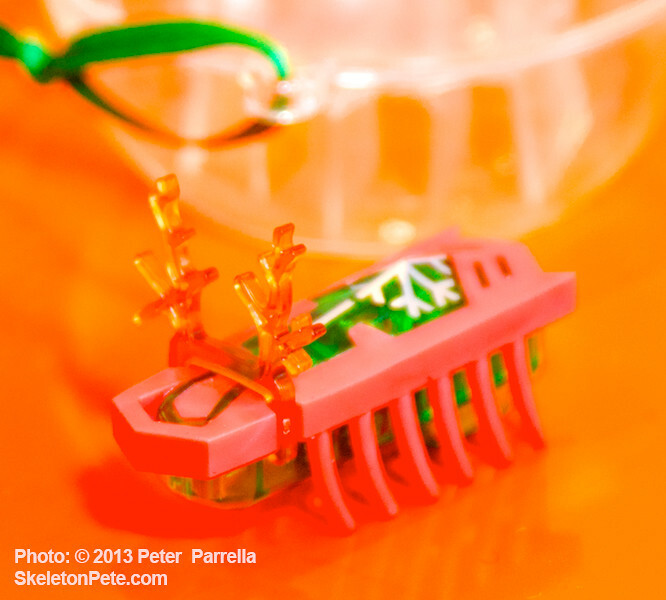 Hexbug Nanos can also be found in special Christmas editions, sporting reindeer antlers, snow flake design motifs and neatly packaged in tree trimmer ornaments. 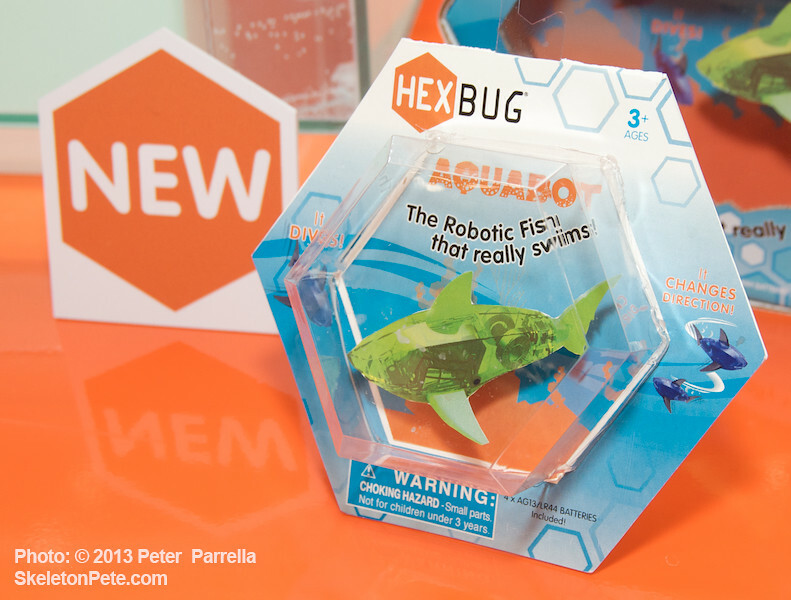 For a gift on a more restive note, Innovation First offers the amazing AquaBot, a robotic fish activated when – you guessed it – placed in water. 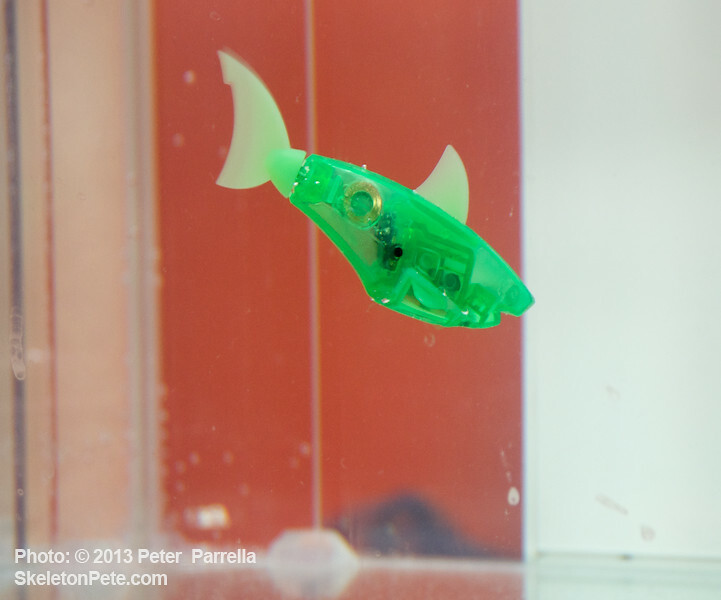 Aquabot comes in an assortment of colors and emulates all the soothing movements of your favorite aquarium dweller but requires no feeding, no tank filter, no clean-up, just the occasional battery. 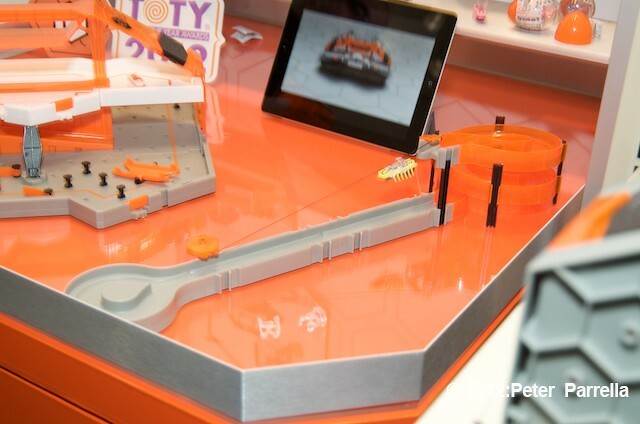 This is only a smattering of the gear in the Innovation First line which includes full and XL size Hexbug creatures, the bobble head Moshi Monsters and Tagamoto Auto track sets. Check the related posts below for more details. 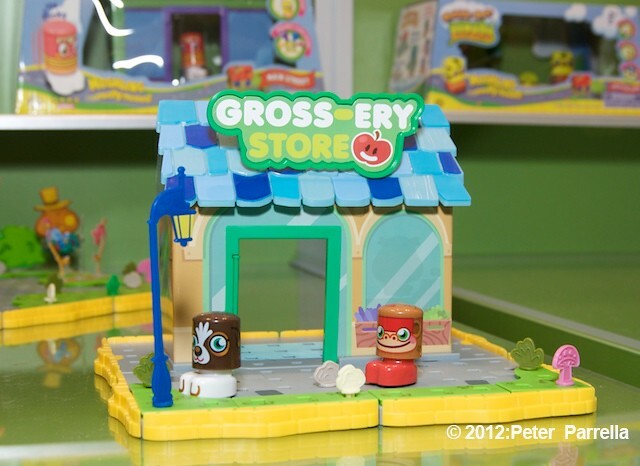 These images are of Toy Fair 2013 pre-launch displays, but all of items are currently available at your retail toy store as well as online. 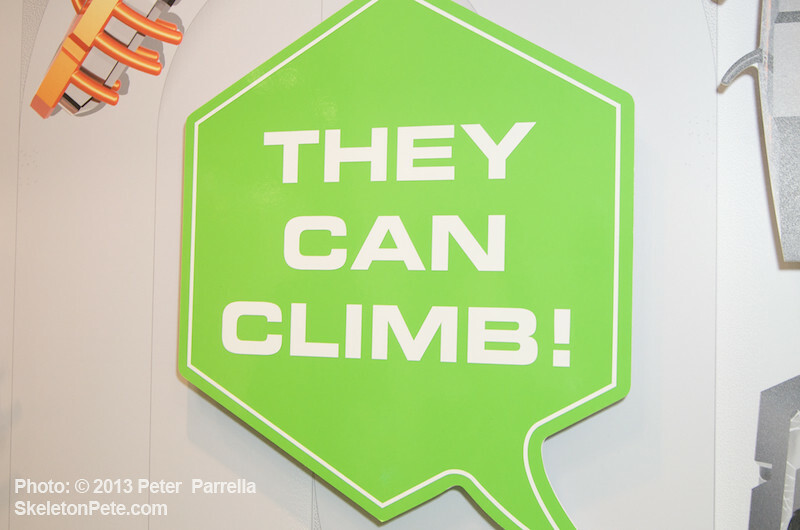 Toy Fair 2012 was a great opportunity to become familiar with lots of new products scheduled for roll-out over the next year but it was also fun to visit with the representatives of some of last year’s favorites and see their newest product spins. 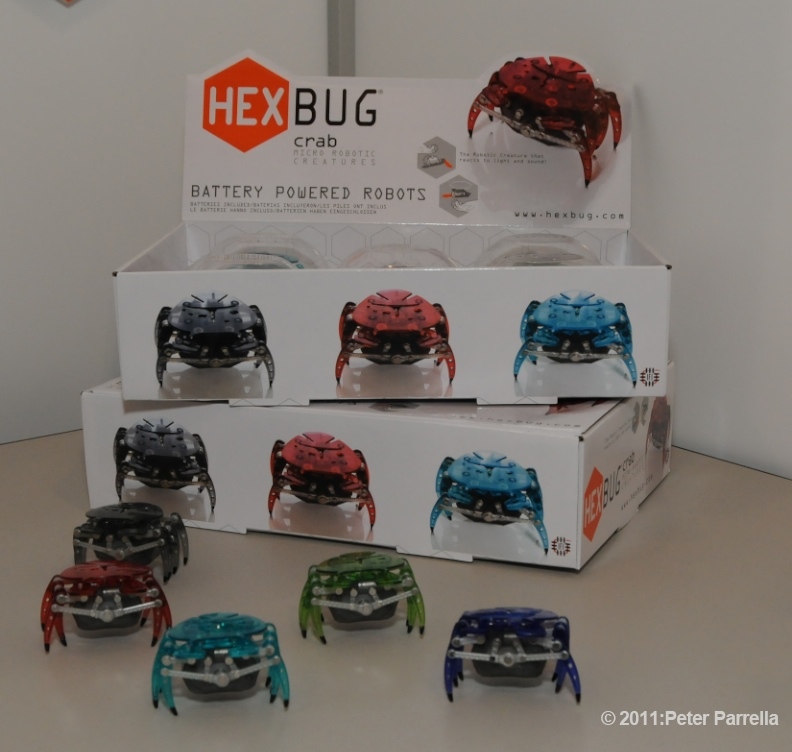 That was certainly the case with the folks at Innovation First who welcomed Ken Pierce and I into their booth for a peak at the latest updates to the Hexbugs universe. 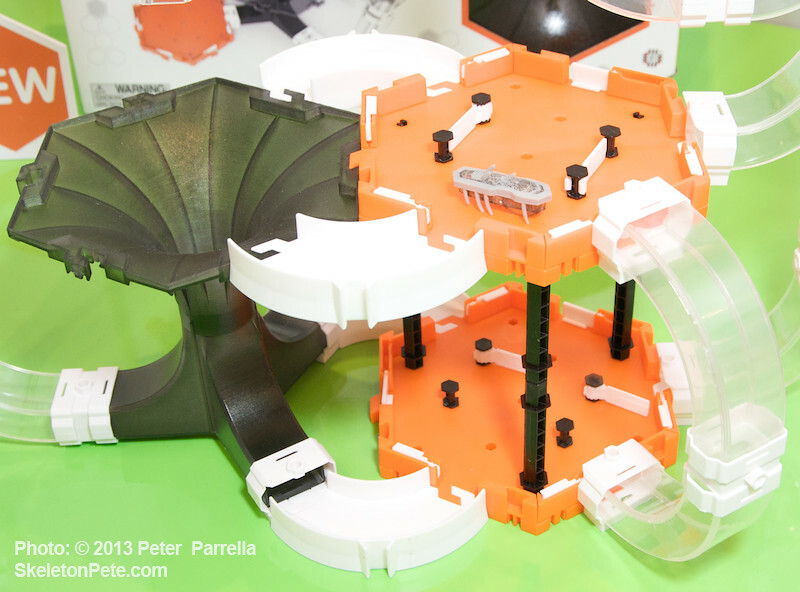 Updates include more modular base plates, allowing for Hexbugs exit/entrance from varied positions of your choice. 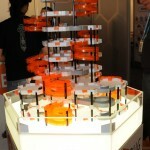 The plates also have a series of slides and whirly-gigs that make watching the jittery robotic insects even more fun. 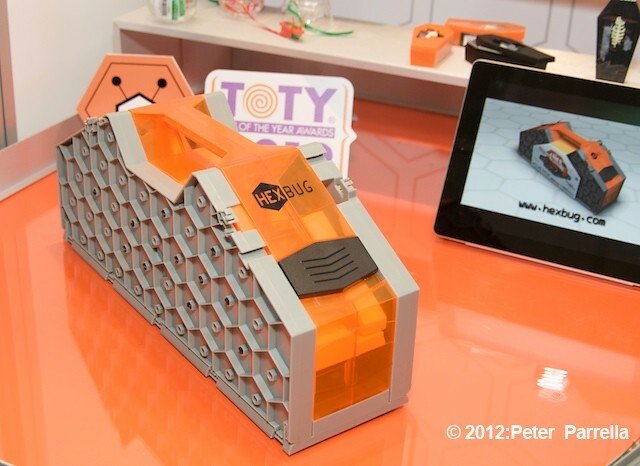 Clip an optional hook to the back of your Hexbug and watch it slide down guide wire equipped elevations. 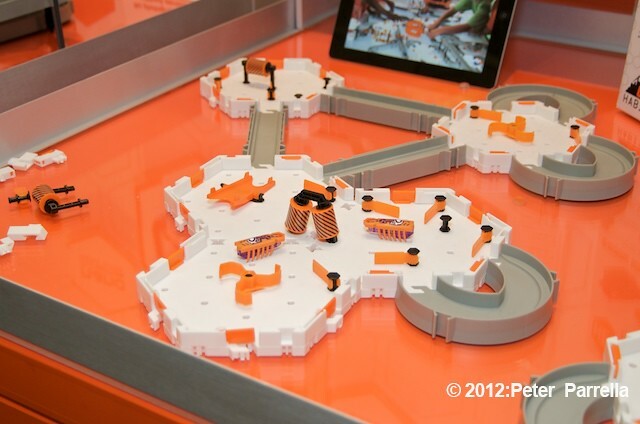 I was really happy to see Innovation First Labs take top honors with a Specialty Toy of the Year Award for their Hexbugs Hive Habitat Set. This portable version of the Habitat product neatly folds up into a molded handle carrying case to easily tote your Nanos wherever you go. 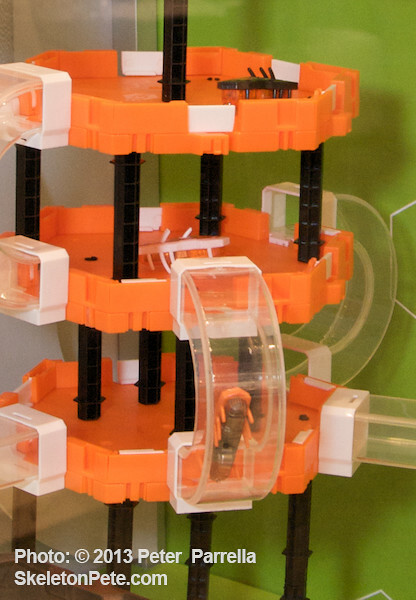 Like the rest of the line everything is expandable once you reach your destination. 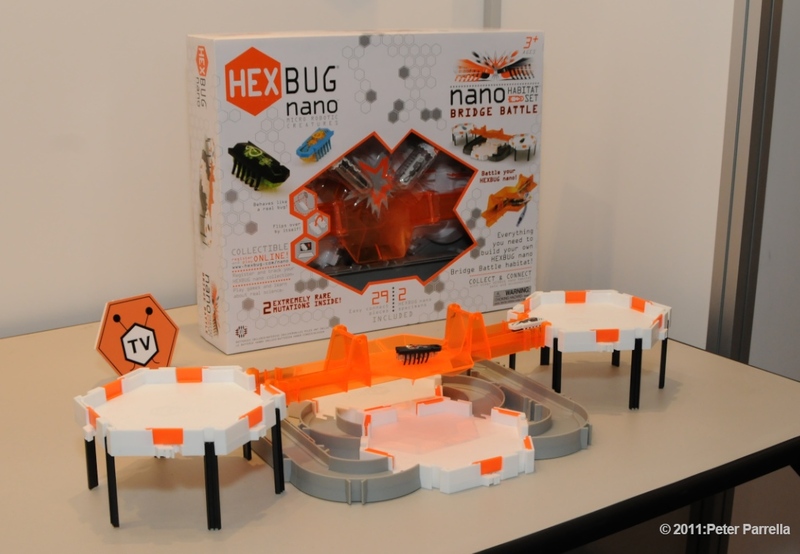 On the horizon are Hexbug Warriors, an extrapolation of last year’s “battle bridge” concept. 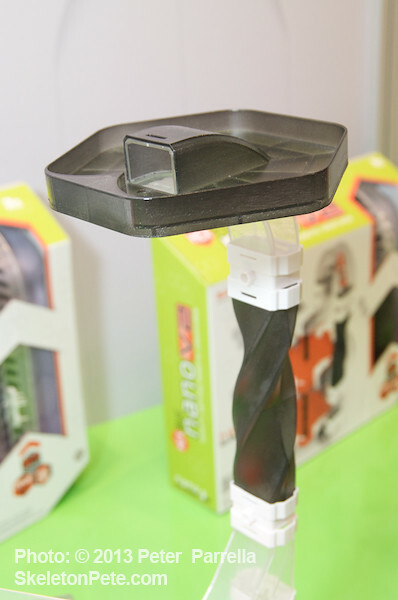 Warriors can be outfitted with snap on weaponry ranging from buzz-saw blades to drill noses. 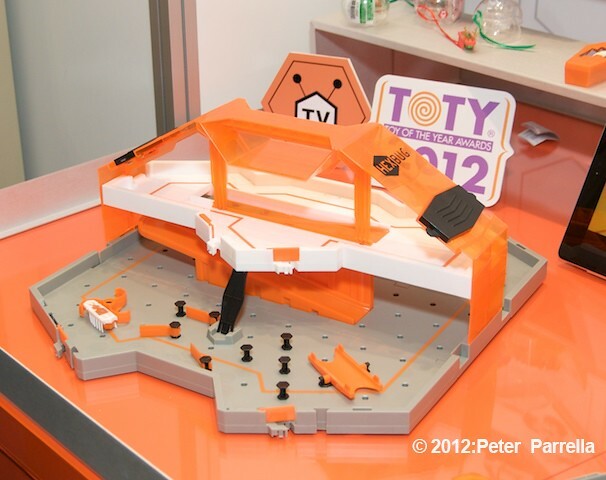 Open sided concave platforms make for the arena ground and the toys push and nudge each other until one falls to the level below. 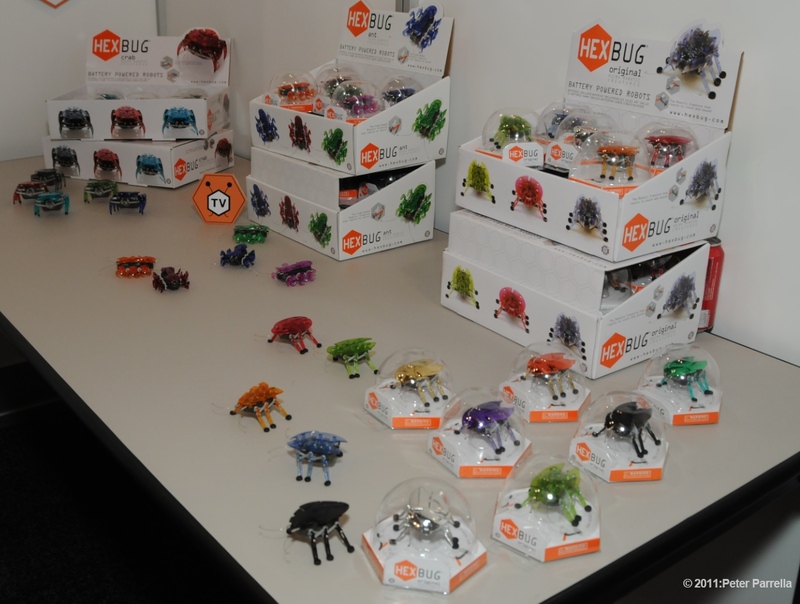 For younger gamers and Mom’s who just can’t stand the sight of bug-like crawlers skittering around the living room floor First Innovations has introduced a series of tiny Bobble Bots. 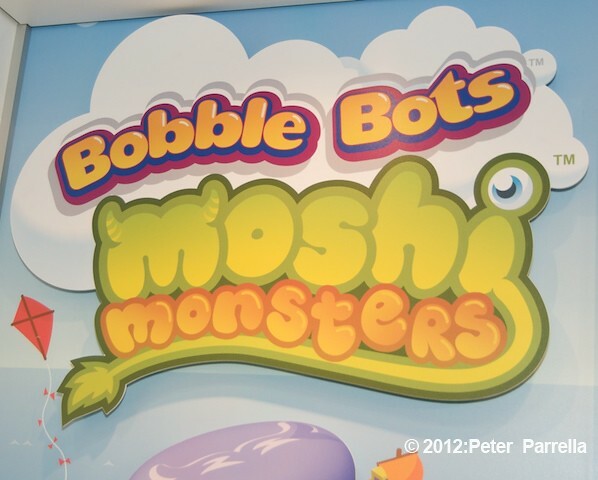 These shaky noggin creatures are based on online “virtual pets” Moshi Monsters, each with their own cool personality. 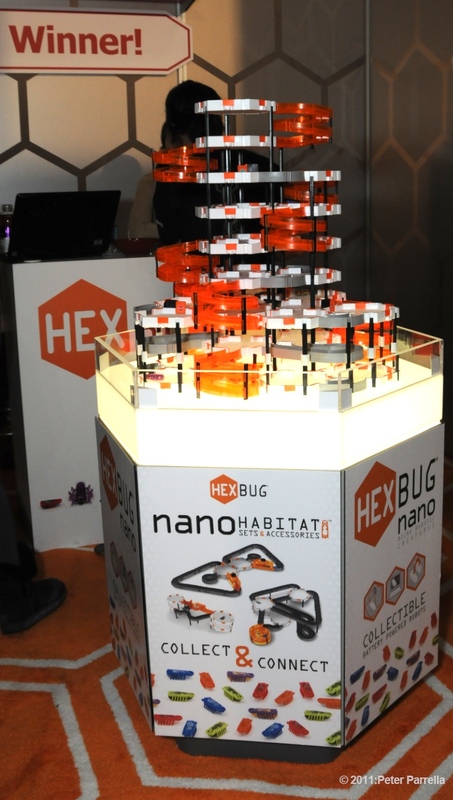 Like Hexbug Nanos, they have a modular environment to traverse with little houses and shops, trees, shrubs, and lamp posts that can be turned into a complete village. Swing away doors allow the critters to bop in and out of the buildings, and their erratic perambulations are mesmerizing. 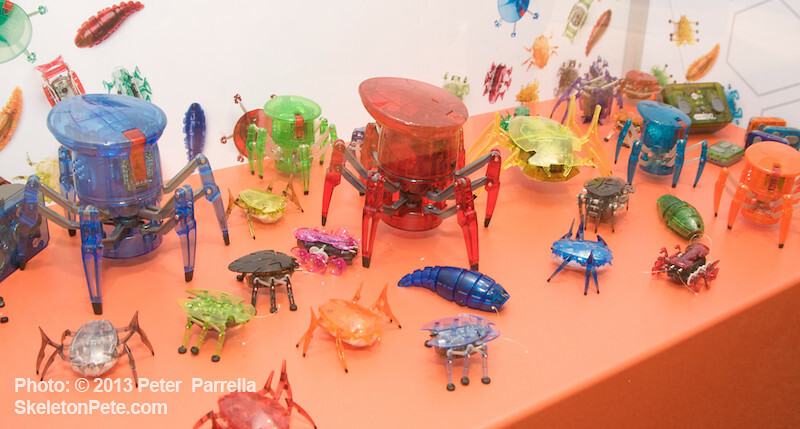 New Yorkers may have already had enough of creepy crawlers this season, hosting our own convention of Bedbugs, but I think even the antsiest of city dwellers would make an exception for Innovation First’s phenomenally fun line of micro robotic arthropods. 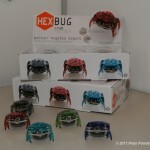 The company, known for it’s educational Vex Robotics Systems used in upper grade classrooms recently expanded into the toy market with a series of ant, spider and crab replicates called Hexbugs. Each has a unique perambulation. 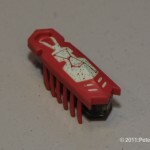 Some are “free-ranging” little buggers guided solely by chance contact with their antennae, others can be controlled with a wireless mini remote, some react to sound and others to light. 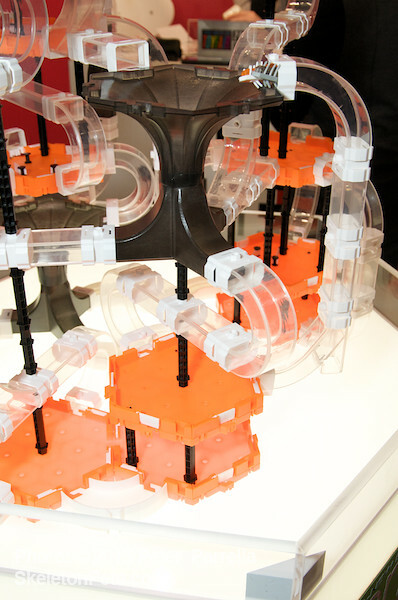 All are well built, run on watch batteries, and are mesmerizing in action. 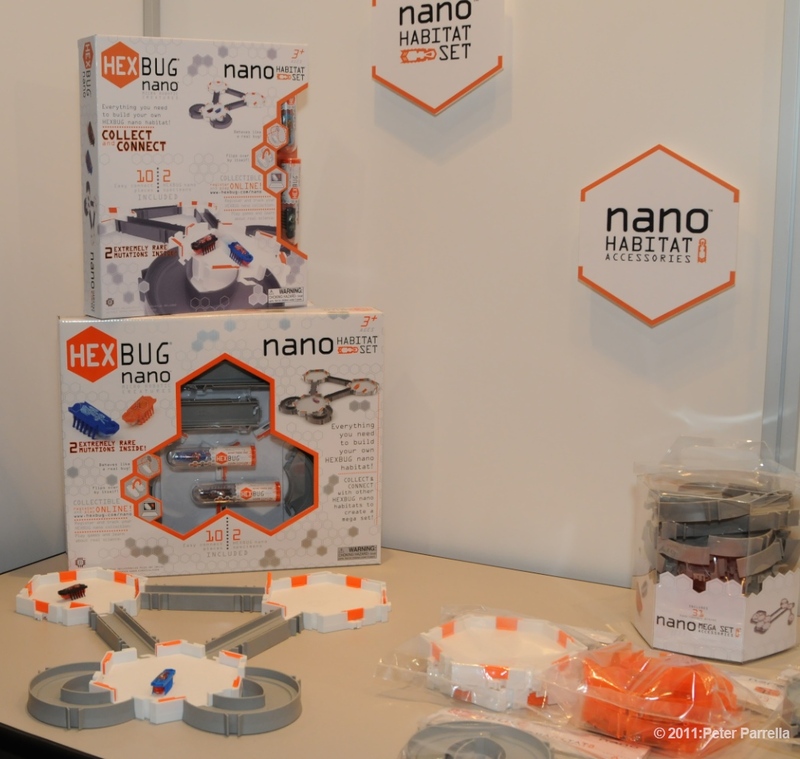 The newest – smallest – addition to the product line are called Hexbug Nanos and they are my favorites. 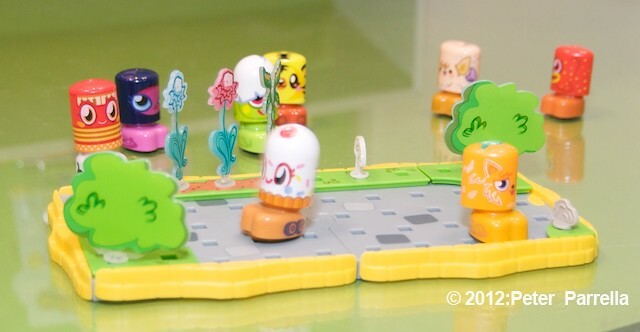 While you could allow them to skitter aimlessly and crazily along, adding the modular track system to the picture gives these little jitterbugs a more purposeful existence. 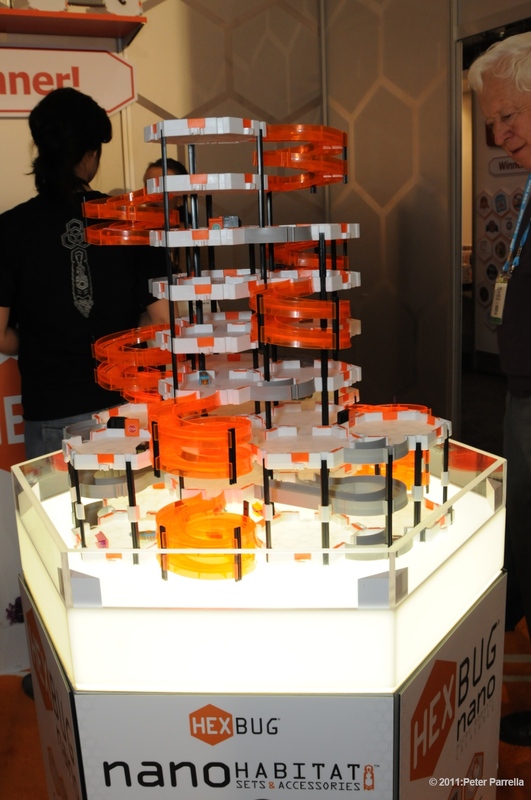 Track configurations can be endlessly revised and added to, and there are many kits to select from. 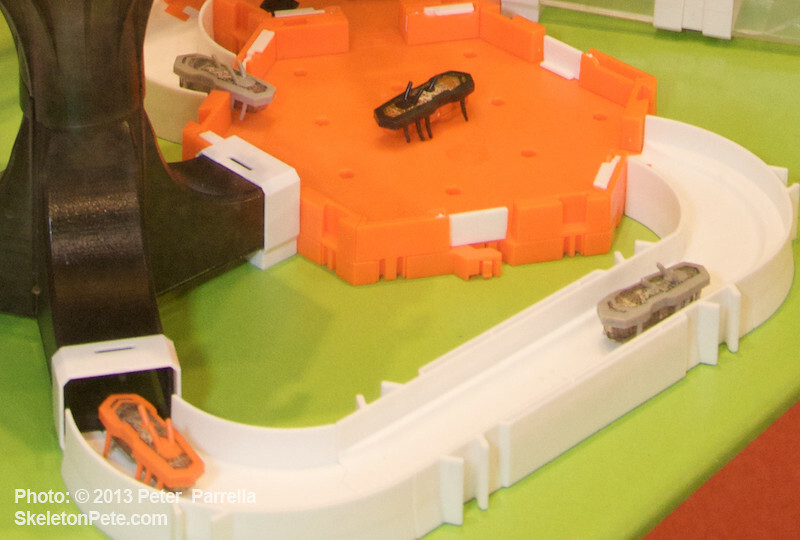 Choices include race tracks (“Gentlemen, start your thoraxes”), habitats and elevation spirals for building multilevel bug-scapes. 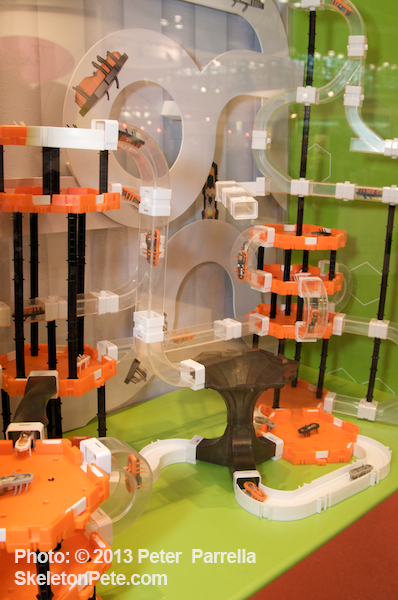 Best of all is the “Bridge Battle” set where multiple Hexbugs compete to push each other over the side of a concave platform. 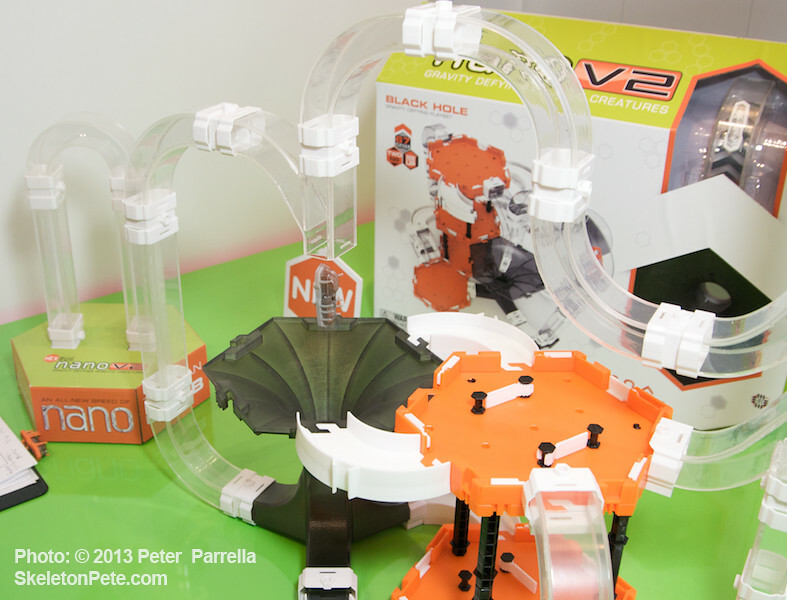 Just introduced is the “glow in the dark” track series in matte black for you heavy metal fans. 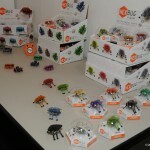 The bugs themselves can be individually purchased, come in a variety of colors and finishes, and sport their own constellation based “ink”. 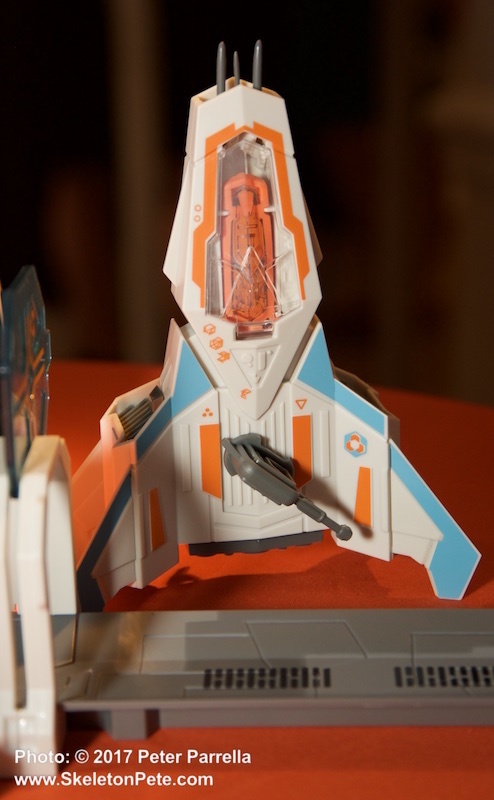 I could definitely see the more artistic minded going at these puppies with a paintbrush and some stickers to really customize their creature crew. 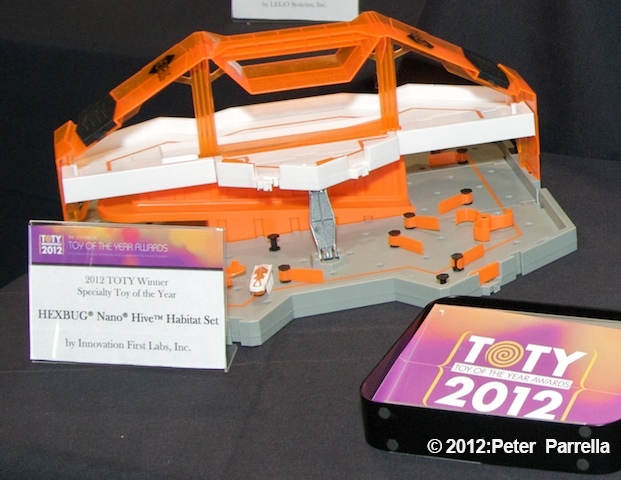 Thanks to the gang at the Innovation First’s Toy Fair 2011 booth for giving PiercingMetal.com’s Kenny Pierce and I an informative insider tour. 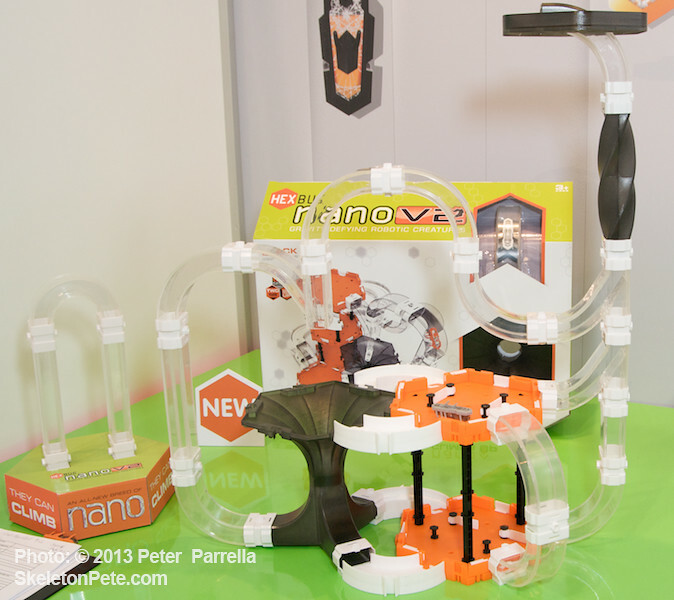 We suggested a product demo on HSN or QVC around holiday time would make for blow out sales. 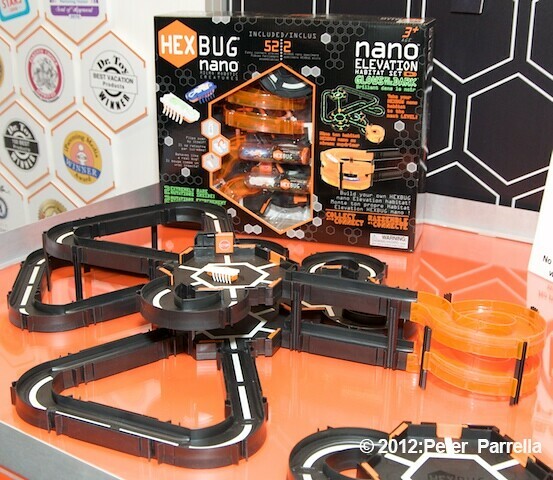 Hexbugs top my gift list for my godson’s up-coming birthday – ’cause I wanna play with them too. 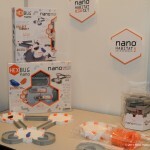 Check out the Promo Videos. 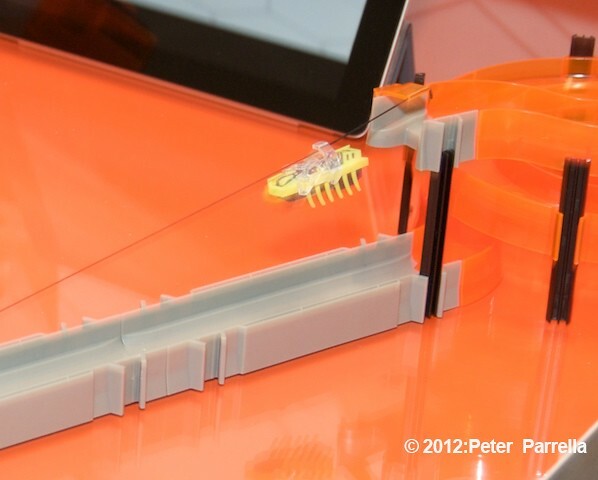 Click any image to launch the lightbox display.